We meet the New Year with joy and gratitude. The primary end of the Incarnation is God’s Glory! He is the One absolute Good and cannot will anything, apart from His Glory! The work of creation glorifies God in His Wisdom and Omnipotence; the work of the Incarnation glorifies Him in His merciful Love. As Christians we are, of ourselves, proofs of God’s Glory. Our elevation to the supernatural state, our sanctification and eternal happiness have, for their supreme end, the Glory of Him Who has redeemed us. Christians and all consecrated souls, must act in such a way that their works and their whole lives may be a praise of glory to the Trinity and to Christ Our Lord. We cannot be too grateful to God! What better way to begin the New Year, then, by counting the blessings of the year gone by: big or little, no matter how insignificant they might have seemed? Every time, we thank God for a blessing, it is the leaven of our lives. Doing this, keeps us whole and aware of the Kingdom of God truly within us. God is always in control, always acting for our greatest good. A grateful person is a happy person. The key to a constant flow of grace is a constant flow of gratitude. Acts of gratitude will erase darkness from our mind, heart, body and soul, and fill our whole being with light. Gratitude is a source of energy; give thanks in all circumstances, in joy and in pain. Thankfulness is a builder and a healer! It is a lifter and life-giver, a fortifier and comforter! When praise is used, unexpected good happens in every corner of our lives. Look up to Heaven, look above your problems and thank God for His goodness and His Love. The Wise Men came and laid their Gifts before the Child that day; But greater than the Gifts they gave, were those they took away! WITH MARY EVERYTHING! WITHOUT MARY, NOTHING! God brings creation into being out of nothing. His masterpiece, therein, after the humanity of Our Lord and Savior, is the Immaculata: Daughter of the Father, Mother of the God-Man, Bride and Sanctuary of the Holy Ghost. She has a position that far surpasses all the Angels and Saints. As Mediatrix of All Graces, Mother of Good Counsel and Help of Christians, She guides the soul that seeks and loves God to its eternal goal. Mary stands by Her children in battle; She defends the Church in Its warfare with the forces of darkness which, today, have assumed apocalyptic proportions. Blessed is the soul whom the Immaculata allows to see Her greatness and glory, and who She calls to serve Her unconditionally! Blessed be the man whom the Immaculata employs as an instrument in carrying out the plans of God for the salvation of the world! Mary stands alone in Her perfection and power as God’s masterpiece. She is the great sign in the heavens, which leads the Christian army into combat against Satan. She is victorious in all of God’s battles. God has given Her to us for these very days as the last means of salvation, the final refuge of His persecuted and oppressed children. Mary has a great role to play in the life of the Church and of every individual because God willed it so and not otherwise. The more deeply we penetrate into the mystery of Mary, the more we become inflamed with love for Her. When Mary proclaims that, in the end, Her Immaculate Heart will Triumph, then all who live in the Heart of Mary will win the victory. Those most especially consecrated to that Immaculate Heart will be an intimate part of Her Triumph!!! God’s work of creation is a great movement of love which pours forth from Him and flows back to Him again. Just as the divine life descended from the Father through the Son in the Holy Ghost into the Immaculata and from there to creatures, so too this life returns through Mary in the Holy Ghost, to the Son, and from the Son back to the Father. She is the summit of creation and the bridge over which all the paths from Heaven and to Heaven travel, the nave which bridges the distance between God’s majesty and the guilty sinner. The Immaculata with Her radiant Heart touches the whole world. From Her flows the entire love-filled outpouring of the Trinity into souls. Mary comes to the aid of Christianity in its tribulations, draws men to Her Immaculate Heart (Consecration), leads them back to God (Conversion) and calls them to participate in the building up of Christ’s kingly reign (Reparation). The time has come! Mary’s position as Mediatrix of all Graces is beginning: Creation returns Home to God! The significance of Mary is so great that She is drawn into the interior of the Life of the Most Holy Trinity. Mary becomes, through Her motherhood, a blood relative of the Trinity. Thus, no man goeth to the Father but by the Son, and no man goeth to Christ but by His Mother. Mary becomes the life of the Priesthood of Christ and the dispensatrix of all the graces of His Sacrifice to mankind. Mary is the mother, bride and helpmate of the New Adam and completes the Priesthood. It is God’s Will that we should receive everything through Mary that Christ has done for us. Until the end of time, the Holy Spirit works in the Church as the “Soul of the Church” that fills everything with life and brings It to perfection: The Sacred Liturgy, the Sacraments, the sanctification of souls and the conferral of graces. 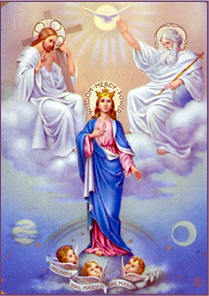 However, the work of the Holy Ghost in its entirety takes place in the Immaculata and through the Immaculata. Mary is joined in an ineffable manner to the Holy Spirit because She is His Spouse; it is the union of Her very being with the being of the Holy Ghost. He Himself is love in Her, the Love of the entire Trinity, a fruitful Love, a conception. It is significant that Mary stated Her name to Bernadette at Lourdes, “I am the Immaculate Conception.” In the Holy Ghost, Mary is the source of the Incarnation. The conception of the Father and the Son, takes place in the inmost of Her being, in the Heart of the Immaculata. She is completely and utterly dependent upon the action of the Holy Spirit; yet Her action is real and, through charity, Mary is one with the Holy Ghost. Mary’s Heart is completely immersed in the Love of God, without any distance, shadow or hesitation whatsoever. She receives the entire fullness of God. As Mother of Christ the Redeemer, Mary became Co-Redemptrix of the human race and, as Spouse of the Holy Ghost, She participates in the distribution of all graces. The manifestation of this fact is the Miraculous Medal in Rue de Bac and at Lourdes. Every grace for souls comes from the hands of the Mediatrix of all Graces and never a moment goes by in which She does not grant ever-new graces to each individual soul: Graces which enlighten the mind and strengthen the will. 2. The Grace of Sanctification. By Conversion, we are loosened from the shackles of the devil, whose head She continually crushes and, through Sanctification, She leads the soul closer and closer to God and unites it with Him. If someone falls into sin, gives himself over completely to vice, despises God’s graces, and makes himself unworthy of grace, need he despair? NO! Not at all! For God has given him a Mother who observes all of his thoughts, words and deeds, and with Her compassionate Heart, She hastens to his side even without being called, to the place where the greatest misery prevails. She enters the soul befouled with sin and vices, and begs for it the grace of light and strength of will to be reborn in Christ. All conversions begin with the Mediatrix of all Graces. Mary is the mercy of God itself. An infinite mercy which longs to save, heal, restore and redeem. Mary builds up the kingship of Christ in the world through Her queenship. Mary’s apostolic mission in the world is unique and universal. Nations who have remained faithful to Mary have also preserved the purity of their Faith in the divinity of Christ. Today, the great heresy is religious indifference, which allows the soul to become paralyzed in the stupor of egotism and to be swallowed up by passions. Mary will vanquish this heresy like all others. To Her is reserved the great victory for our days. To Her belongs the honor of saving the Faith from shipwreck. What is needed is intensive apostolic life by Total Consecration to Mary. Through the holy Scapular of Mount Carmel, the Mother clothes Her child and protects it from the snares of Satan at the moment of death, so that it cannot be lost. The work of the Holy Ghost in the world for the salvation of souls is impeded the moment the greatness of Mary is obscured or people separate themselves from Her. Our Duty as Christians to remain loyal to Mary will be for us the Guardian of our Faith. Heresies are developing at a dizzying pace, the abomination of desolation is in the holy place and sects run rampant; truly, these are the last Days. And, it is precisely now that God has given to us a safe refuge: Mary’s Immaculate Heart. Let us make haste and go there! May it be our burning drive to open this refuge to all souls, and help them find their way to the interior castle therein which contains the fullness of the Trinity: God Alone! Mary is the spotless Bride of the Holy Spirit, His true instrument, and most sacred temple. Therefore, Mary is the crown, the very summit of the revelation of Divine Truth. The Mystical Body of Christ belongs to Mary, “My beloved to Me!” By this is meant that the Church Triumphant, Militant and Suffering belongs to Mary, or better still, Jesus Christ combating against Hell on earth, Jesus Christ triumphant in Heaven and Jesus Christ suffering in Purgatory in His members, belongs to Mary because Our Divine Savior gave His holy Mother all things together with Himself. Mary likewise belongs to the Church Militant, Triumphant and Suffering, “I to my beloved,” for this Son, Jesus Christ, has given Her to the Church Militant that She might be the general of Her armies. He has given His Mother to the Church Triumphant as a resplendent sun filling the hearts of the blessed in Heaven with incredible joy, second only to the joy they experience from the Beatific Vision of the Face of God. Christ has given Her to the Suffering Church as a Mother of Mercy and Comforter of the Afflicted, who is ever spreading comfort and refreshment among those scorching flames of divine justice. Mary must rule in our hearts. In the measure that we submit our hearts and the movements of our hearts to Her, and abide by Her decisions and yield to Her will, She becomes Queen of our hearts. On the divine ladder leading from Heaven down to creatures, Mary is the final rung, the reservoir of all graces. From this perfect vessel flows the entire work of God into souls. 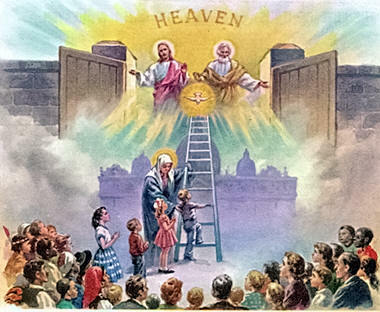 On the ladder of our ascent into Heaven, Mary is the first rung. At the end of time, She will appear as the perfect Bride who contains within Herself the whole redeemed world. She is the New Jerusalem. In the end, Mary’s Immaculate Heart will Triumph, God’s work will reach its culmination and perfection, He will give Himself to His children for all eternity in the dwelling place that He has prepared, the tabernacle of God among men, in His Heaven, in the Immaculate Heart of Mary! IN YOU, O MARY, MAY WE SHARE THE OCEAN OF GOD’S LOVE WITHOUT END! 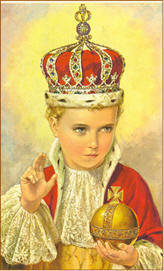 This entry was posted on Wednesday, January 9th, 2013 at 11:27 pm and is filed under NewsFlash, Saint Philomena. You can follow any responses to this entry through the RSS 2.0 feed. Both comments and pings are currently closed.